Yehudi Menuhin believed that by exercising our senses through the arts and paying attention to the diversity of European cultures, we would become capable of generating genuine respect for others and desire for peace, accomplishing individual and collective achievements of all who bear the burden of responsibility for this world of suffering. Menuhin was thoroughly convinced that children should all receive a creative education which encourages rather than suppresses a child’s gifts, thereby nurturing an enlightened generation of individuals who would reject and eradicate all forms of violence. The reasoning was that the arts would enable the development of young people’s personalities towards greater open-mindedness, respect and the desire for peace. Twenty years after Menuhin’s death, in a Europe plagued by fear and distress, one of the many societal challenges to be met is the social inclusion of migrants through education. In recent years, European schools and researchers have finally started focusing on arts in education as an innovative learning method, particularly for children from disadvantaged or immigrant backgrounds or for those having learning difficulties. Many projects have been designed to promote innovative educational methods in Europe that integrate all forms of creative arts in primary schools. Some have been empirically based, while others have taken a more scientific approach, based on analysis and evaluation from the perspective of various disciplines: social sciences, pedagogy, psychology, anthropology, cultural studies or intercultural dialogue. 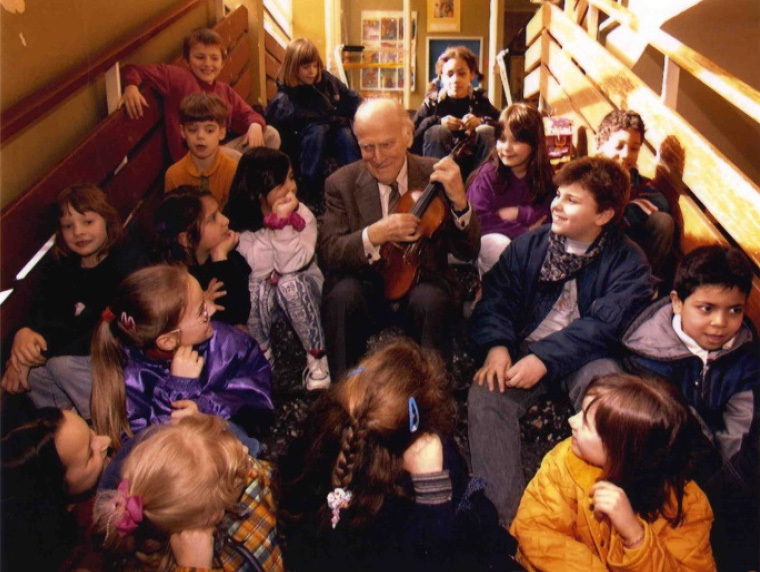 This last is the case of the International Yehudi Menuhin Foundation’s MUS-E® programme, which has been operational for more than 25 years in primary schools in several European countries. The programme, managed by national MUS-E® associations, offers artistic workshops for children aged between six and twelve to awaken their sense of creativity, empathy and resilience, enabling them to explore and exploit their potential and becoming genuine creators of change. The META – “Minority groups Education Through Art” European project builds on the longaccumulated experience of the MUS-E® network, as well as on the innovative achievements of the International Yehudi Menuhin Foundation’s other projects, such as ART4ROM and MUSIC4ROM, and E-ARTinED. META’s core premise is that the arts can improve certain key competences in children, including motivation, concentration, self-confidence, teamwork, critical thinking, cognitive and verbal skills, among others. In other words, the practice of the arts in school is closely linked to a pupil’s social and emotional development and academic achievements, as well as to greater civic engagement and understanding of equal opportunity, not only in the classroom but also in society as a whole. The META project proposes a clear methodology and tools using different art forms that aims to reduce the learning disparities of pre-school and primary school children from minority groups (including the Roma). The project is also developing a new, collaborative learning and teaching methodology for European teachers, which would be conducive to enhance social cohesion and further nurture European citizenship. The piloting experiments conducted as part of the META project in four MUS-E® countries (Belgium, Germany, Italy and Spain,) illustrate that the use of music, song, dance and the visual arts in the classroom stimulates a more creative and enjoyable educational experience for children and, above all, facilitates their integration in school, which otherwise could be a major challenge. A multicultural Europe whose goal is social inclusion cannot afford to allow so many children with disadvantaged backgrounds to leave school prematurely. If Europe is to advocate societal change, we cannot sit back and accept the continued overwhelming preponderance of children of migrant or minority backgrounds who are school dropouts or poor academic performers, simply due to the fact that specific educational needs are not currently being addressed by conventional education policies. Moreover, the risk of dropping out of school or of being left behind academically does not only affect children of migrant or minority backgrounds. Innovative educational approaches using the arts as a lever for creative and transformational expression can be effective for children of all backgrounds and contribute to inspiring teachers and parental involvement. These approaches therefore broaden the virtuous circle that allows all individuals to tap into their own backgrounds and participate in co-creating the future.